I'd like to thank El for a recent comment regarding family history. It got me thinking about what kind of history we're leaving behind. Of course we cannot regain things that are lost, but I think it's worth preserving history that we might take for granted. The family stories that everyone knows or the photos that everyone recognizes may not be familiar a few years from now. I'm very thankful for thoughtful people who write names on the back of old photographs. It also got me thinking about another ancestor of mine, my great-great-grandmother Erie Irene Harts Burrows. She went by the name Irene Burrows. 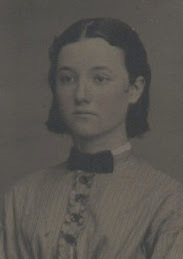 She was born in 1850 in Pennsylvania and at a young age moved to Illinois. Shortly before her death in 1933, she wrote a short little autobiography for her kids and grandkids. Oh, how I wish I had something like this from everyone. It is short, but something is better than nothing and I'd encourage everyone to leave something like this. I'm sure some of these things seemed pretty mundane at the time, but are pretty interesting today. Mrs. Erie Irene Harts Burrows was born in Nippenose Valley, Lycoming County, Pennsylvania, on the seventh day of December, 1850, the daughter of John and Rachel Harts. Here on a small cleared farm, in this little valley surrounded by dense forests and rugged mountains, I spent my childhood days until the spring of 1856 when the little farm was sold and I with the rest of the family came to Illinois. My father, John Harts, bought a farm on what was then called the Delaware Prairie in Logan County, Lincoln, Illinois being the county seat. On this farm the town of Hartsburg was later located in honor of my father. The family spoke German or Pennsylvania Dutch. My Parents being very religious, it was seen that we all had an opportunity to attend Divine Services. Although the nearest "Little Church In The Wildwood" Union Church, a Cumberland Presbyterian Church, was six miles distant, my good parents were eager to have us all with them. "Rain or Shine" we were always found in the House of God. So, very early in life, I was converted, along with my three brothers and two sisters, and united with the Cumberland Presbyterian Church. Our school was over one mile distant. Here I attended school until after the Civil War, which broke out in 1861. My two brothers, D.H. and P.W. enlisted in the 106th Illinois Infantry in 1862 and served until the close of the war. When the war was over, a young soldier from the 2nd Illinois Calvary came to our locality, Charles E. Burrows, formerly from Milford Center, Ohio. This meeting ripened into love and on the second of July, 1868 we were married. Mr. Burrows was a farmer, and this we did for some time, renting farms. Later we moved onto some land of our own, where we built our first home. Here we lived until 1883, when we rented our farm and home in Illinois, and moved to Cheney, Kansas. My husband engaged in the Lumber and Coal Business with my brother, S. H. Harts, at this place and here we built our second home, a five roomed cottage on an acre of ground. We were now the parents of three children: Ella, born July 2, 1869; Maud, born July 5, 1871; Clarence born August, 26,1881. After three years at this place, we rented our home (later selling it) and moved to Wichita, Kansas, where we built our third home at 1153 University Avenue. Here my husband had work on the Police Force, appointed several times as Chief of Police of Wichita. In this home we lived for twenty-five years. Here our little daughter was born November 13, 1887: Jessie Irene Burrows, who later married W. E. Benton of Wichita, While living in Cheney, we all, except the youngest, united with the M.E. Church. Now, you see, all of this has covered quite a bit of tie, and now I must tell you something of my own individual life during all of this time. My greatest pleasure was to care for my family, husband and little ones, and next but not least, attend to our religious duties. I didn't say "Go" to my children, but said "Come, or we may be late", and went with them. I joined most of the different activities of the church--the W.F.M.S., H.M.S., Aid Society, was a teacher in the Sunday School, Steward on the Official Board, a member of the W.C.T.U., sang in the choir, lead the singing in the Sunday School for some years in Dodge Avenue Church, also president of the W.F.M.S. the same length of time. Was teacher of the Martha Class for many years, also. Gave that up when I came to California. I loved to take parts in entertainment's. After coming to Kansas, I gave readings--"Curfew Shall Not Ring Tonight"; "Only the Moonlight"; "I Will Paint You A Sign Runseller". In Illinois I was the leading lady in a play "The Last Loaf". Gave it two nights. Said to be very good. So you see I was a busy woman. My Earliest Recollections Before I was four years of age my parents took me to Philadelphia to visit my fathers people. I remember that distinctly. Then at four, when my youngest sister was born, I remember my father bringing we children downstairs and showing us our little sister. About that same age my mother took me to a home where a young man lay dead, to rub his hand across my neck to cure a thick neck I was afflicted with. I think it did the work. My life was a happy one. Had many pleasures. My first sorrow was the death of my dear, good father in 1867 at the age of 58 years old. In 1905 my mother passed away, aged 82 years. Then my youngest sister in 1906, aged 51 years. Then later in 1909, my companion, aged 62 years. Some years later my brothers, all in a good age--76, 78, 77. So that leaves my one sister, Mary M. Shull, Fort Scott, Kansas, and myself out of a family of eight. Father, mother, and three brothers and three sisters. All gone but she and I. I had quite a few pleasure trips. In 1878, I with my little daughter Maud, had a trip from Hartsburg, Illinois to Trinidad, Colorado. Here we spent ten weeks at the home of my sister, Mrs. R. Hatfield. Then later had a trip from Hartsburg, Illinois, to Wichita, Kansas, a visit this same sister. Some years later my mother and I had a trip to Missouri from Wichita, Kansas, to visit an uncle, my mother's brother, Lafayette Minsker. Spent six weeks at the World's Fair in Chicago, Clarence, Jessie and I. Their father being a guard on the Fair Grounds, we went to visit with him. Then later at the United States Prison at Leavonworth, Kansas where he was on duty as a guard for six years. After the marriage of Jessie, and she and Will moving to Florida, her papa and I decided to spend some days in that place, something we had planned and talked over for some years. So in the Fall of 1909 we spent the month of November in that beautiful sunny clime with our dear loved ones who had gone so far from their home. We had many happy hours while with them, one of the most joyous was the fishing in the St. Johns River. Papa not being good in health, we were back home in less than three weeks when he passed away the 27th of December, 1909. This left me all alone, all the birdlets having left their old nests to make new ones of their own. My days being lonely now, I spent much time away from home. In the Spring of 1910 I made another trip to Sanford, Florida. Something seemed to draw me in that direction. Returning home in July of that same year. Then again before the holidays, I took the third trip south, remaining until Will, Jessie and baby Paul moved up north to Topeka, Kansas. My old home on University Avenue where I and my family had lived for twenty-five years and all our four children had grown to womanhood and manhood, married and gone to homes of their own, seemed so empty and lonely. I felt I must sell, get me another home where all the old memories ever stood before me, so I found a purchaser, sold and built me a new home a few blocks away on 625 Martinson Avenue. After this I took three trips to California, later selling my home in Wichita and moving out there. And here I am, living in Laguna Beach, within a stone's throw of the ocean. Lived one year near Santa Monica and some years in Upland. In all I have lived seven years in this beautiful state of California. My children all live near me but Mrs. Roton , "Maud". She's still in Wichita, Kansas. I have lived to a good age, 81 years old the 7th day of last December. Am Grandmother to 12 Grandchildren and 19 great-grandchildren and expect to live to see one Great-Great-Grandchild. And so ends the chapter of my life. Much more I could write; how I cared for some of my loved ones when sick., made short visits to see them , helped care for my Dear Mother for five months, day and night in her last illness, etc. But I will stop for now and think over my many happenings that have transpired in my long life. Have had many lovely friends, no enemies, and feel I'm ready to go Home. But before I close this history of my life I must tell you some of my pleasures. All my earliest years were spent on a farm. But those who have not lived a part of their lives on a farm have missed some of the most perfect pleasures of this life. My good parents were a very busy people, and yet they believed in doing some things for recreation and pleasure. Do you think you would enjoy going to a creek and fishing and swimming, gathering wild grapes , plums, crabapples, black walnuts, hickory nuts, hazelnuts, wild black berries, and to those who cared for them, Paw-Paws? Well, this is what we did many times of Saturday afternoons, while the seasons for such things lasted. And sometimes we would find a bee tree with combs full of honey. That was a great find. We would be obliged to go home, get some containers, go back and fill up on honey. Of course the tree would have to be felled in order to reach the sweetness. Those were happy days. Then when winter came on apace we had a bin of apples, also potatoes, and my good father would butcher about 8 or 9 big fat pigs and a beef and divide that up with a neighbor, and how we did feast on the good things we all liked so well. We were at this time living in a log house and we children would go upstairs around the Kitchen stove pipe where it was warm, and make a raid on the black walnuts which we had hulled and dried ready for use, when the snow began to fly. There was no depression at our house in those days. The children of this age do not have the opportunity to do some of the things we did in those primitive days. When I was a very small child, how well I remember helping to plant the corn. My sister Mary, just fifteen months older than I, took our little baskets on our arms and dropped the corn in furrows of a forty acre corn field. And Illinois had some windy days at that time, and how the wind did blow and switch our dress skirts around, and scatter the corn as we tried to drop it in the furrow. And our brothers followed us and covered up the corn with the hoe. There were no idle men at that time. Machinery was not in use yet at the time of my life I am writing about. Many inventions have been perfected in the 82 years of my life. We burned tallow candles, lard lamps, I remember well when I saw the first coal oil lamp and sewing machine. Many were the moulds full of tallow that I had to use. We had to keep a supply on hand or be in the dark when the sun sank to rest. Also had to keep on hand a supply of bread, cakes, etc. For we couldn't but it, like now. We did all of our sewing by hand. My Grandmother had to make the cloth to make her men's clothes out of. She was the mother of twelve children. Raised eleven of them, and died at ninety years of age. All these things, I was blessed with as a child, and many more things that I haven't mentioned, but will close by saying my life has been a very happy one. What a gem that short letter is! My grandmother's sister left such a letter and the family shared it with me so I have some remembrances from my maternal grandmother's family. But she was the only one and certainly not as early as this one! Finally had a good moment to dedicate to reading this letter; how wonderful it was!